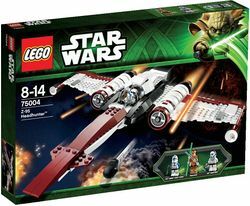 75004 Z-95 Headhunter is a Star Wars set released in 2013. It includes Pong Krell, a 501st Legion Clone Trooper, and a 501st Clone Pilot. This is a description taken from LEGO.com. Please do not modify it. Battle the Separatists with the versatile Z-95 Headhunter™! Features Z-95 Headhunter™ with retractable landing gear, opening cockpits, tool rack and a LEGO® Technic shooter! Although stated for release in 2013, these sets started showing up in stores in December 2012. The Z-95 can be seen not only on its own LEGO.com product page animation, but also in the respective animation for the 75013 Umbaran MHC (Mobile Heavy Cannon). Facts about "75004 Z-95 Headhunter"